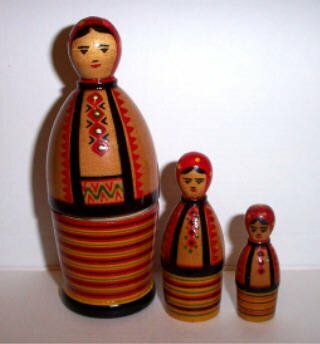 Vintage USSR Russian nesting dolls Ukrainian Family These are 3 piece Russian Matryoshka set made in the Ukraine. The size of the biggest one is 5.5 ''. These dolls are with very unusual shape . They are in very good condition, with some very small chipping on the hats of the first doll...This is typical with the Ukrainian dolls.